It was a great day. Hot, and the drive home made it tiring. But, lots of good company and plenty of great cars. How often to you get to travel from Memphis to Luxora via Jericho, not to mention Joiner, Frenchman's Bayou, Sunset, Wilson, Driver, James Mill, Burdette, & Osceola? Our group consisted of Jim Hofer (AH3000), Rob Cosgrove (DeLorean), Rob's daughter (E-Type Jaguar), Charles Coleman (E-Type 2+2), Tom Eckert & Sherri Williams (MGC), and me, Jim Duke, (MGB). We took the 'old road' - US 61, and almost had the road to ourselves. Since it was a fairly early start on Saturday, driving up to Blytheville was very pleasant. Temperatures were in the 70s and traffic was light. Robert & Nancy Zenanko (MGC) were joining us as we went through but we got past them somehow. They caught us on the show grounds in Blytheville. Gordon Gold had planned to come along, but the throttle cable in his Sunbeam Tiger snapped just as he first touched the footfeed before starting out (Tammy refused to sit athwart the engine and manually work the carburetor feed, so Gordon was forced to cancel). Blytheville's 'Cars & Cycles Against Cancer' show was a great success. They put on a great show, with lots of street rods, a handful of classic cars (even two Crosleys! ), lots of two-wheel iron (mostly HDs but several GoldWings & ricers) including one Triumph Super Sport 500. A one-owner 1931 Model-A Ford two door sedan was there, a 1957 Ford retractable hard top convertible, a Plymouth Super Bee, one 427 AC Cobra (actually a reproduction), a Shelby GT350 Mustang, a handful of Corvettes, and a lot of very nice street rods & high performance pickup trucks. Only a few of the British Motoring Club of Arkansas made it up. They brought a nice original Mini, Jim Wheeler's beautiful Triumph Spitfire, and a couple of MGBs. 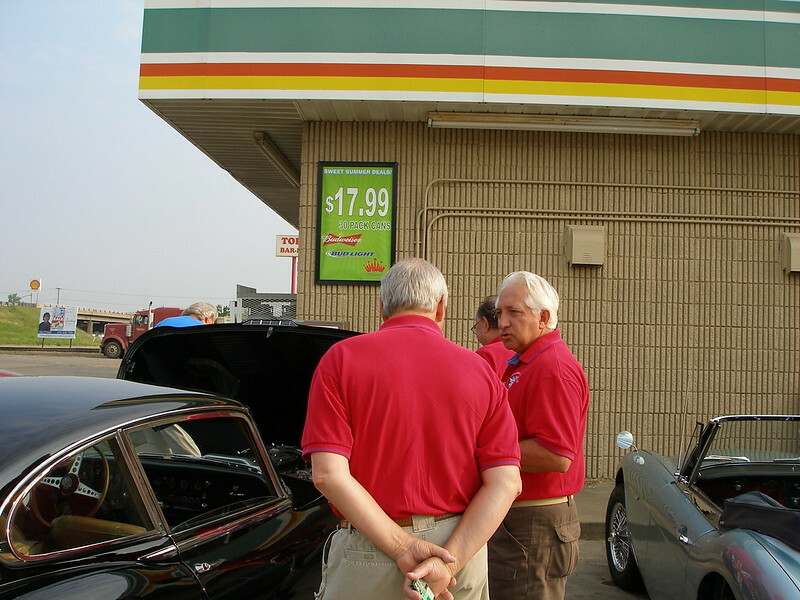 Thus, the Memphis club had them outnumbered and out cylindered - my MGB had the smallest engine in our contingent - everyone else drove at least 3 liter lumps! Jim Hofer's beautiful blue AH took the special $200 prize for the best British car. Both of Rob Cosgrove's cars got big awards, and the Blytheville folks made special presentations of nice plaques to all the British iron present. It was a fun, and rewarding trip. Our drive home was uneventful other than summer heat. We didn't do as good a job staying in caravan as we had done going up. We seemed to separate every time a stop sign or traffic was encountered, but got back together in Osceola, then at a refreshment stop in Wilson, AR. Wilson is a very picturesque little town - take a look next time you travel through northeast Arkansas. We all got home safely - hot, tired, but happy - missing only those folks who couldn't make this year's trip. Folks in Blytheville say they'll keep a light on for us next year, too. Oh, by the way - the 'Cars & Cycles Against Cancer' show raised - are you ready for this - $14,000 to be donated to the American Cancer Society. Wow! Those folks know how to do things.